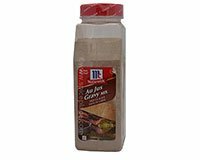 Natural Style Au Jus Gravy Mix. Makes 5 Gallons of Au Jus. Au Jus is great with roast beef, standing rib roast, or for the famous French Dip Sandwich. Directions: Add Au Jus Mix to water. Stir and Heat to boil. Prepare Au Jus mix according to package directions. Add sliced roast beef to pan with hot Au Jus. Allow beef sit for a minute or two. Layer sliced roast beef on crisp French rolls or bread. Serve each sandwich with prepared Au Jus for dipping. Ingredients: Salt, Corn Starch, Dextrose, Hydrolyzed Corn Gluten, Corn and Soy Proteins and Wheat Gluten, Beef Fat, Caramel Color, Onion, Corn Syrup Solids, Maltodextrin, Garlic, Spices, Celery, Sodium Carboxymethycellulose (Thickener), Sodium Caseinate (A Milk Derivative) and Natural Flavor. Leg of Lamb with Au Jus Gravy More Recipes..